Analysts Say Boeing Slow To 'Own' 737 Max Crashes After a second 737 Max jet crashed in less than five months, it took Boeing weeks to speak openly about the role its flight control software may have played. Critics say that's too long. After a second 737 Max jet crashed in less than five months, it took Boeing weeks to speak openly about the role its flight control software may have played. Then on April 4, CEO Dennis Muilenburg said: "It's our responsibility to eliminate this risk. We own it." Questions about the safety of the 737 Max trace back to Oct. 29, when an Indonesian Lion Air flight plunged into the Java Sea. At the time, Boeing issued a terse statement extending "our heartfelt sympathies to the families" of the 189 victims. It said initial investigations showed the downed 737 Max had faulty data from a sensor. Jeffrey Sonnenfeld, a professor at the Yale School of Management, says Boeing's response bordered on pointing a finger at pilots overseas. "There was a question as to whether or not the pilots followed the right routines initially and if they were properly trained," he says. After that business as usual resumed, and orders kept pouring in for the 737 Max, the fastest-selling jet in the company's history. Over the next two days, countries from China to Europe grounded the planes. But in the U.S., Boeing's CEO announced that the company was developing an update to its MCAS software, and that the FAA did not require any further action. And Muilenburg even called the White House to say there was no data to support grounding the planes. Erik Bernstein, vice president of Bernstein Crisis Management in Monrovia, Calif., says this reaction may have aimed to protect Boeing legally. "You don't want to say something that is then translated in a court of law as an admission of guilt," he says. He says that, in the short term, the tactic could also have financial benefits. "I would assume that they were selling those planes up to the day they got grounded, or at least attempting to," he says. "They're keeping business partners and investors from being spooked." Boeing says it was not avoiding responsibility, but rather waiting for the facts to emerge. "Airplane accident investigations are a tragic, horrific and sad undertaking, but they must be underpinned by fact and data," said Boeing spokesman Gordon Johndroe. Richard Levick, CEO of the Washington-based communications firm Levick, says Boeing's response did not go over well. "They weren't personal. They weren't empathetic. They were speaking like engineers and they weren't very visible," he says. Levick says Boeing didn't convince the flying public of the plane's safety. A telling moment was when Kayak.com offered passengers an option to filter out the 737 Max from their flight options. "We're taking actions to fully reassure airlines and their passengers of the safety of the 737 Max," he said. The turning point was when Ethiopian authorities released a preliminary report on April 4. Transportation Minister Dagmawit Moges said the pilots had followed Boeing's directions. "The crew performed all the procedures repeatedly provided by the manufacturer but was not able to control the aircraft," she said. This is where Muilenburg's public posture shifted. In a carefully worded message, he acknowledged that MCAS had added extra risk to the cockpit. "As pilots have told us, erroneous activation of the MCAS function can add to what is already a high workload environment," he said. "It's our responsibility to eliminate this risk. We own it, and we know how to do it." "We own it" has since become a catchphrase for Boeing. Last week, Muilenburg spoke at the George W. Bush Presidential Center in Dallas and told a crowd that recent weeks "have been the most heart-wrenching of my career." 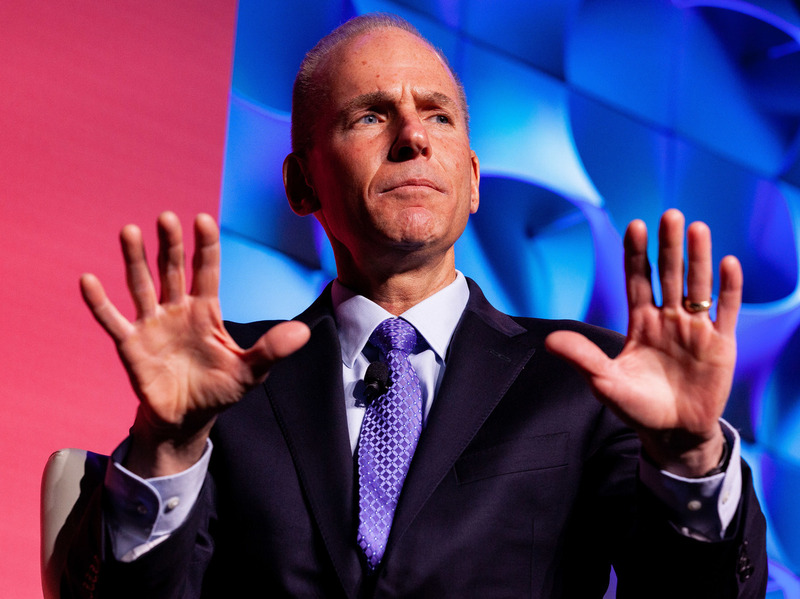 "These recent accidents have intensified our commitment to continuous improvement as we design, build and support the safest airplanes in the sky," Muilenburg added. "That's what we do at Boeing. We own it." It was a safe audience — Boeing has donated millions to the George W. Bush Institute, and Muilenburg didn't take questions. And Muilenburg has not given a press interview since the second of the two crashes. Still, Bernstein says Muilenburg has taken a baby step in the right direction. "And I think that opens them up to really get a lot more compassionate with their communication," Bernstein says. There is a downside. Houston attorney Nomi Husain is suing Boeing for negligence on behalf of a victim's family. He says Muilenburg's new approach of taking responsibility gives ammunition to his case. "This admission I think helps us clear the hurdle of negligence," Husain says. Boeing must get its software fix and extra pilot training approved to get its planes back in the air. Once that's done, perhaps the new transparency will help convince passengers that the 737 Max is safe to fly.